I love technology, but I’m certainly no expert. I just think technology is cool. I like the idea of computer games, but I stopped playing them after I graduated university. I play with blogs and computers, but I don’t have enough knowledge to really do anything. So, I’m not going to talk at length about all the wonderful computer games that were on display at Hyper Japan (although there were many). All I’m going to talk about is robots. When you think of technology and Japan, I’m sure “robots” come to mind. 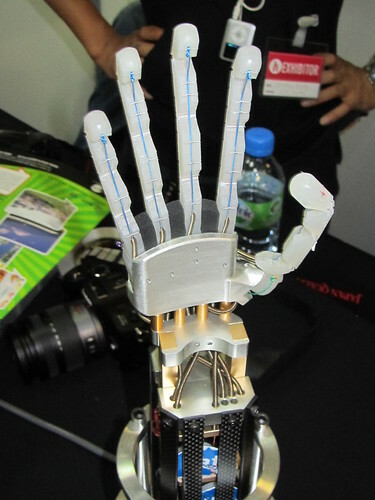 Japanese robotic technology is probably the best in the world, and the most famous. 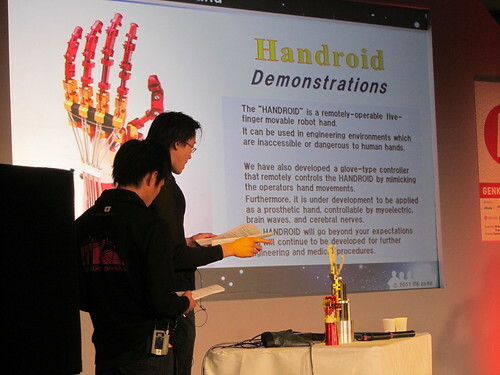 At Hyper Japan, I was lucky enough to see a talk by ITK (a company consisting of members of Research and Development from Iwata Machinery Works Ltd), which included an exclusive showing of “Handroid“. 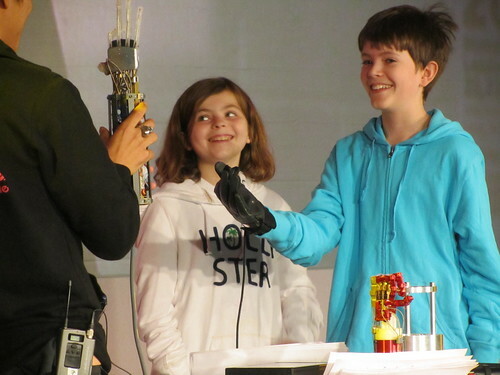 With the aid of kids from the audience, ITK demonstrated how the Handroid can be operated remotely using a special glove. When I visited the ITK stand and chatted to Shintaro Iwata and Kenji Sakai, they also showed me their Mechanical Walking Stick (“The Shinsuke“). ITK’s other designs include the Electric Weed Buster, ITK-DPF (Digital Photo Frame), and the ITK Wheel Adapter. You can read more about ITK on the ITK website. Thank you for visiting at our booth and the great article !